I'm so excited to finally be able to make this post! I've spent months visiting thrift shops and searching for deals to create the perfect back to school wardrobe for our soon to be kindergartner. Back to school can be an expensive time for many families- especially if you have more than one child. For the past couple of years, I've been having really great success finding quality brand name clothing at our local thrift store, and I'm OBSESSED! For M's wardrobe we've decided on a 70/30 system when it comes to thrifting, meaning we purchase 30% new and 70% thrifted. There are obviously a few items I refuse to buy thrifted like socks and underwear, hats, and pants/shorts (I'll explain that one in a minute), but for the most part, you can find a lot of really great items at a fraction of the retail price. The item is in good/excellent condition. This means no stains, tears, missing buttons, broken zippers, and minimal pilling. The item is a known brand. I prefer to purchase tried and true brands that we love, so I know exactly what to expect of the quality. Our favourite brands of kid's clothing are: GAP, Columbia, LL Bean, Old Navy, Joe Fresh, Nike, Carters/OshKosh & The Children's Place. The price is right. I've been frequenting thrift stores for long enough that I know when something is a good deal. I won't pay more than $4 for a brand name hoody, and no more than $3 for a t-shirt. I would go as high as $10 for good shoes or outerwear, but even that is pushing it. This is why I typically refuse to buy pants or shorts at a thrift store. For some reason, the thrift store's I've been to mark pants up like crazy. For example, they could have a brand name hoody that was originally $50+ for $4 but a pair of pants that were originally $15 sell for $7. My favourite stores for pants and shorts are GAP Factory, The Children's Place and Carters/OshKosh. I like to stock up during 50% off sales and end of season clearance. If you're going to thrift for your child's school wardrobe, I recommend starting at least 6 months ahead of time. Sometimes I find a lot of great items during a thrift run and sometimes I find nothing at all. 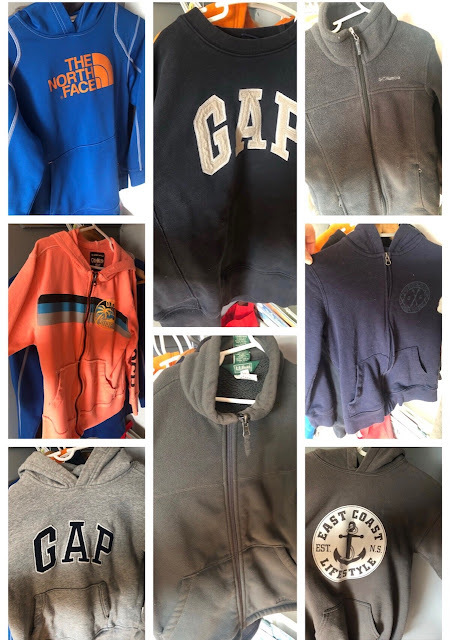 Aside from thrift stores, you can also search your local buy and sell groups, however I find that most people over price things on those groups. I also don't typically like to buy items in a "lot" because often there will be things mixed in that we don't like, or that isn't in the best condition. I prefer to hand select the things we buy, and buy each item with a purpose in mind. Some of our thrifted t-shirts for Kindergarten! I don't have a rule on how many items to purchase, but I typically like to have about 2 weeks worth of current sizes, and some larger sizes waiting for when he grows out of the current ones. School age kids are going to get messy, tear the knees out of pants, come home covered in dirt, paint, etc, so I like to have enough clothes built up that I'm not constantly replacing things that get ruined or worn out. 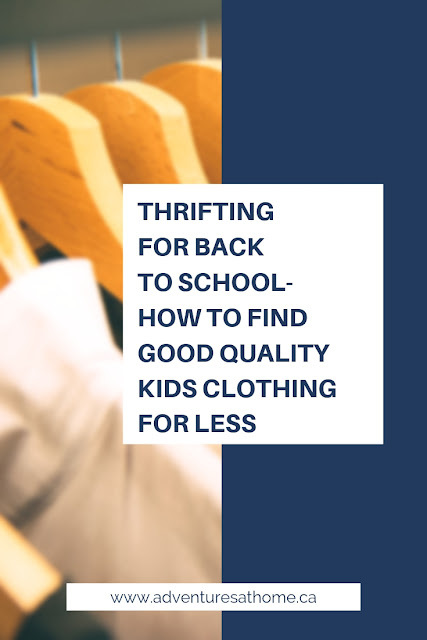 Now that we are less than 6 months out from the start of school, I would recommend going to thrift stores about once every 1-2 weeks from now until you have everything you're looking for. If your thrift store has a loyalty program (like the one value village/savers has), sign up now so you get all of the emails for clothing sales. Value village often has 50% off sales on clothing every couple of months, and some of those sales are for members only. The ends of seasons are also a good time to shop. Now that Spring is on the way, they will probably have a sale on winter clothing and outwear soon to make room for Spring and Summer clothing. I also sign up for emails to my favorite non thrift stores and hit the sales there for the new items we purchase. I refuse to pay full price for anything, because things go on sale so often that there's no point. Excellent condition sneakers. We found perfect condition Nike sneakers recently with white soles, that would be perfect for indoors. We are replacing the laces with silicone no-tie laces for kindergarten. They were $5 at Value Village! 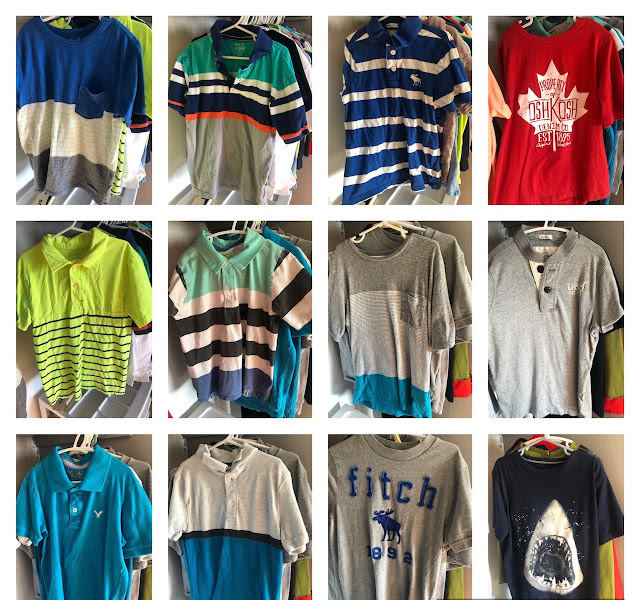 After I have all I need from the thrift store, I start buying his new clothes, which as mentioned above would include any gym pants, jeans, undergarments, hats, etc. I would love to hear about your thrift store finds! Comment below and let me know what you've found lately!